Bowery Ballroom served as this year's site for the second annual Alt Star Party, a fundraiser for the Rock On Foundation during the NBA's All Star Weekend in NYC. New Hampshire native Matt Bonner of San Antonio Spurs fame is also a huge music fan and founding member of this nonprofit, that supports community arts and athletics via grant programs and community events. 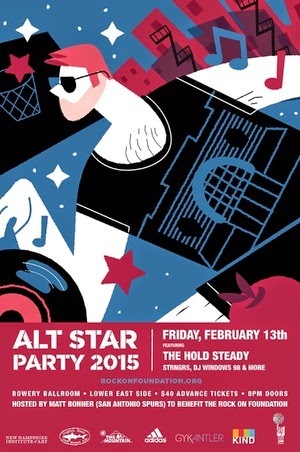 Bonner hosts The Alt Rock Star Party with his brother Luke as a way to together the alternative music scene and NBA. Minneapolis' veteran rock band The Hold Steady headlined the event, banging out tune after tune for the packed crowd who passionately sang along, knowing far more words than the average fan and throwing their own glitter fetti. Brooklyn's power rock trio STRNGRS took to the stage in support, and there were guest DJs throughout the evening: Stefan Marolachakis of Caveman, Chris Tomson of Vampire Weekend, Dapwell (formerly of Das Rascist) and DJ Windows 98 a.k.a. Win Butler of Arcade Fire, who closed the night (or rather early morning) after a team win at the NBA Celebrity game.